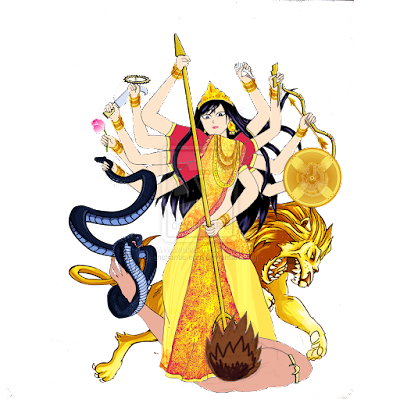 In 'Durgasaptshati', there are many stories related with Aadi-shakti putting many asuras to death in the form of Durga/Kali. These Asuras seems imaginative and hyperbolic in their mythological descriptions, but deeper thinking suggests otherwise. 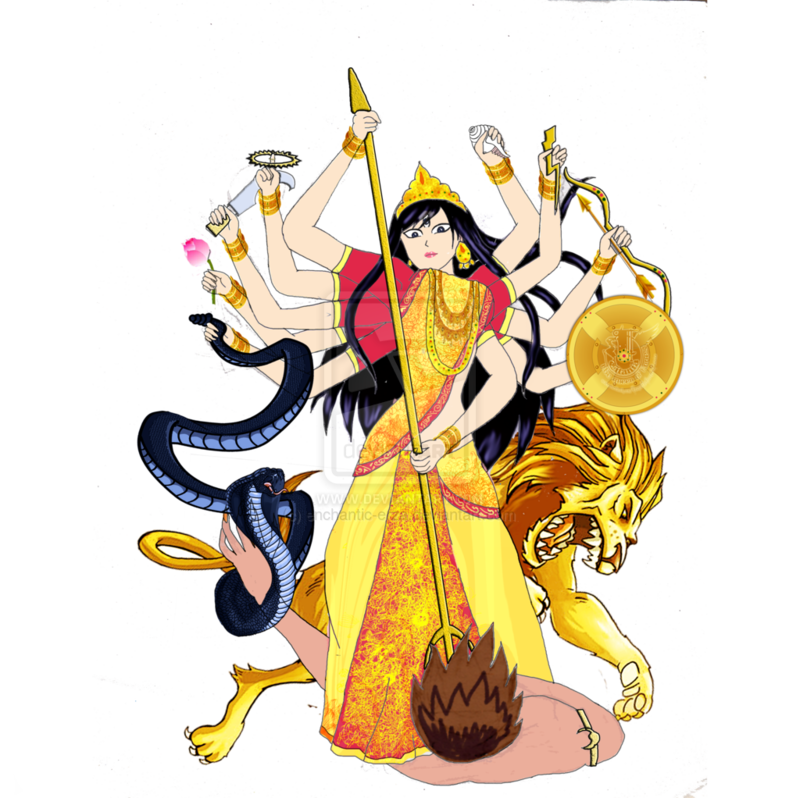 Actually the festival of navaratri represents wiping out the evil tendencies (asuras) within us by invoking the shakti, the divine feminism. In this article, an attempt has been made to identify these asuras, which cripples and demean our personality. It would be highly helpful in the process of evolving oneself, if we understand the symbolism associated with stories describing killing of asuras. (1) ‘Madhu and Kaitaba’ – They represents craving and aversion (Raag and Viraag) respectively. The dominance of the first results into 'trishna' and prevalence of second culminate into 'vitrishna'. Both are bad for holistic development of a persona and we must get rid of them. In Geeta, Lord Krishna directs us to move towards 'vitraag'- beyond the craving and the aversion. (2) ‘Raktabija’ – It represents that negative force within us, which is in our genes. Its dominance reflects such awkward situations, when our behavior seems not under control despite all our efforts.We try not to show it in public, but get compelled by some inner unknown force. Its seed resides in our genes. We can change it by practicing pranayama and doing regular meditation. It certainly changes those genetic compositions inside us and thus killing the Raktabijasur. When 'Raktabijasur' is transformed, the 'Shakti" (energy) is awakened and negativity disappears. (3) ‘Mahishasur’ –It represents laziness (Alasya), ignorance (Agyanta) and inertia (Jadata); symbolized by black coloured buffalo. We do not want to wake up from this sleep of ignorance and find solace in it. The creative energy (Shakti) imbibes dynamism and maintains motion in life and thinking process and thus killing the dangerous 'Mahishasur’, inhibiting our growth. (4) ‘Shumbh - Nishumbh’– The duo represents doubt (Sanshay)engulfing our mind regarding everything. Doubting the self is ‘Shumbh’, and doubting others is ‘Nishumbh. Do I have my intelligence? Is he making fun of me? Can he/she do the work? Has the person desire to do the work? Does he think me as a good person? When these brothers rule your mind, you starts get falling into deep abyss of negativity. We require re-kindling our inner strength (Shakti) to weed out such demonic forces. (5) ‘Chanda – Munda’ –The negative force 'Chanda' represent the tendency to oppose/denial (Virodh/Nishedh). It has only a head to oppose everything, whether good or bad.It is determined to oppose and to spread negativity by saying 'No'. ‘Munda’ is having no head at all. It forces one not to listen to any thoughts and thus limits the personality. We need Shakti in the form of positivity and open mindedness to deal with these demons duo. (6) ‘Dhumralochana’ – It represents blurred vision (Bhramit Drishti), as the name suggests smoky eyes.It directs one not to perceive things in the right way. It often results into irrationality and indulging into illogical arguments(Kutarka). 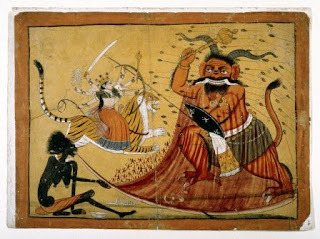 We worship Shakti to give us firmness of mind and wisdom to kill this asura. The whole process in Navaratri festival can be summarized as: Purify the mind and remove all negativity; cultivate positive virtues; gain spiritual knowledge and transcend limitations. And in the life full of enthusiasm and energy, all these six asuras will disappear.